The liberal political sociologist John Campbell is not impressed by “Monday morning quarterbacks” who attribute the horrific plutocrat Donald Trump’s victory in the 2016 United States presidential election to contingent factors like the tactical and strategic dreadfulness of the Hillary Clinton campaign or the last-minute intervention of former Federal Bureau of Investigations chief James Comey. The onset of “stagflation, automation, globalization, and increased international competition,” which undermined the middle-class American Dream in ways that the “populist” Trump exploited by promising to restore lost prosperity. The scapegoating of racial minorities and immigrants as the (false) cause of declining opportunity and income and growing inequality in the post-Golden Age years, which Trump tapped to win white middle- and working-class votes. The rise and spread of neoliberal (“small government” and “free market”) ideology, which Trump mined to promote his anti-establishment/anti-Washington campaign even as he advanced a populist and nationalist critique of globalization and immigration. The spilling over of partisan polarization into crippling political and policy “gridlock” after the 2008 financial crisis, the election of the nation’s first Black president Barack Obama, the passage of Obama’s signature health insurance reform, and the rise of the Republican Tea Party. Trump exploited public disgust with the resulting epic dysfunction of the federal government by posing as a great outsider and savior who would “clean up the mess” and “drain the swamp” in Washington. Campbell’s sixth chapter, titled Polarization and Politics is an unsurpassed discussion of the complex forces that have given rise to the extreme partisan division that plagues U.S. politics even as both the nation’s dominant parties have moved to the right of the U.S. populace. These are critical points that Campbell makes with style and elegance, bringing in other key institutional forces, including nation’s campaign finance laws, federal structure, gerrymandering practices, voting laws, primary systems, and two-party winner-take-all elections system. American Discontent is not without problems. If you didn’t know otherwise before reading this book, you might think that Trump won by a landslide. Campbell refers to a “political tsunami that swept [Trump] into the White House” —an odd way to describe an Electoral College victory in which Trump lost the popular vote by three million tallies. Campbell is excessively willing to confer the label “populist” on the billionaire real estate mogul and transparent plutocrat Trump. He should at least attach the label “fake-” (or “faux-”) to the description. Sanders was the only contender remotely close to a genuinely populist major party presidential candidate last year. Campbell finds it “worrisome” that Trump is accelerating the decline of U.S. global economic, political, ideological, and military hegemony. The author exhibits no sense of why most of the world understandably welcomes the flagging power of the U.S., an imperial state that has wreaked almost unimaginable havoc across the planet since as during “the Golden Age”—or of how the waning of the American Empire could redound to the benefit of ordinary U.S. Americans. The fact remains that Trump was largely handed the presidency by a Hillary Clinton campaign and a Democratic Party that made numerous unforced errors. Trump’s victory was not pre-ordained by structural and historical trends. The outcome of last year’s presidential election might have been different but for numerous actions and decisions on the part of key actors, including Trump and his team. They had the smarts to keep the evangelical Ted Cruz wing of the Republican electorate on board for the general election by granting significant influence and position (including the Vice Presidency) to the theocratic right. Historical contingency and human agency still matter. People may not make history under circumstances of their own choosing, but their actions are not just the mere reflections of determinant historical forces beyond their influence. 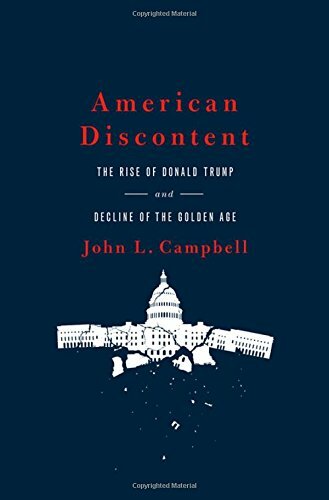 These criticisms and differences notwithstanding, American Discontent is a clever, deeply informative, and often brilliant analysis of key historical forces that have pushed U.S. politics and policy dangerously starboard while providing essential context for the terrifying rise of Donald Trump. It belongs at the top of reading lists on what went wrong in 2016.